When the days are short and the light fades early, there’s nothing like a quilt for color and warmth. A huge variety of potential designs combine floral and geometric precision with unlimited range of colors and a rich history of pattern. This is equally true in both media–textiles and polymer clay! You’ll find plenty of proof inside this beautiful new book from polymer clay artists Judith Skinner and Sarajane Helm. 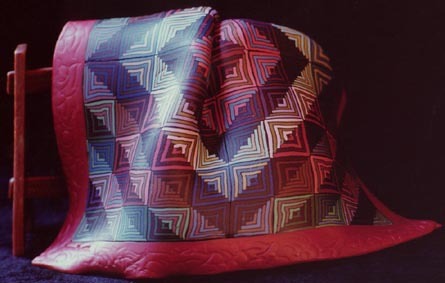 While renowned for developing the “Skinner Blend”, a color gradient technique used worldwide by polymer artists, Judith is also known for her precision caning which often feature quilt patterns. Sarajane’s previous books Create A Polymer Clay Impression and Celebrations With Polymer Clay showcase the decorative possibilities of polymer clay when used in making beads, dolls, ornaments and household items. Adapting Quilt Patterns To Polymer Clay. Inspirations for polymer clay cane designs are found everywhere–in tiled floors, stained glass and textiles are only a few of the rich sources of design elements. Quilt block designs and pieced top patterns lend themselves especially well to millefiore cane making and other techniques used in polymer clay. 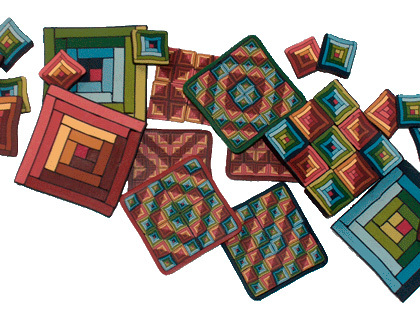 Shown below are several Log Cabin blocks– but not made of fabric; these are millefiore cane slices made of polymer clay. As they are reduced and recombined, amazing patterns are formed. Written with clear instructions for a bevy of colorful quilt block canes and more, this book also features a large gallery of fabulous photos of polymer clay designs by many talented artists. Some are well known names while others are newly emerging into the spotlight and ALL do fabulous work! More than 90 polymer clay artisans contributed to the amazing range of work in this book, and the shelves at the miniature textile featured inside are stocked with hundreds of their bolts of “fabric”–all faux textiles created with polymer clay (as is much of the store itself, right down to the quilt pattern tiled floor! Judith Skinner and Sarajane Helm make it obvious that they not only enjoy working in this versatile mix of media, but also have fun with it…a LOT of fun. Whether you appreciate it purely for the vibrant visual elements or use it as a guide to precision cane making in polymer clay, you’ll find much to savor in its 122 pages. This book is fully stuffed with pictures and information, making it a MUST-SEE for anyone with a love of textiles and quilts, color and pattern, and polymer clay! You are an inspiration to me. I already have 2 of your books. I am trying to see if I can find the new one locally this weekend. Maybe someday I will write a book. It seems like each time I play with polymer clay I learn a easier way for me to do it. Your Great Hope to met you sometime. This book has not only provided me with inspiration but better approaches to an upcoming project of center medallions for prize ribbons (last year it was faux dichroic glass look w/ PC/Utee resin)for an upcoming quilt show. It also was primarily read by flashlight as we were without power for the last 7 days! Thanks! Absolutely love this book! I couldn’t wait to open it. A new venture in polymer clay for me. 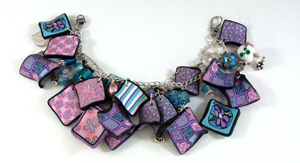 A must have for polymer clay artisians. Excellent! Everything I expected, and worth the wait….beautifully illustrated and written. I know this will keep me busy for a while. Just one question, though…when’s the next one…!!! Outstanding. Looks like the quilts that my Mother used to make and the patterns she used. 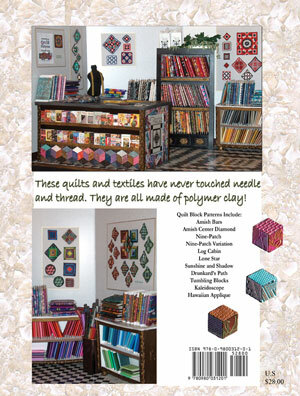 I am a quilter also and these look like you could put them on your bed or hang them on your wall. Instructions are very clear. I especially like the addition of other color schemes to try with each patterns. It inspires you to do more and to create your own color schemes. Great work!!! 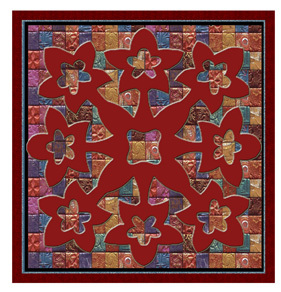 I was so happy when I heard that Judith and Sarajane were planning a book focusing on polymer clay quilt patterns. A few years back polymer clay was an important part of my life and my favorite canes of all were ones of quilt patterns. I have read through this book thoroughly and think both the directions and photography are first-rate. I am even feeling a pull back to the polymer clay world after looking at the new quilt patterns I never had the chance to try. 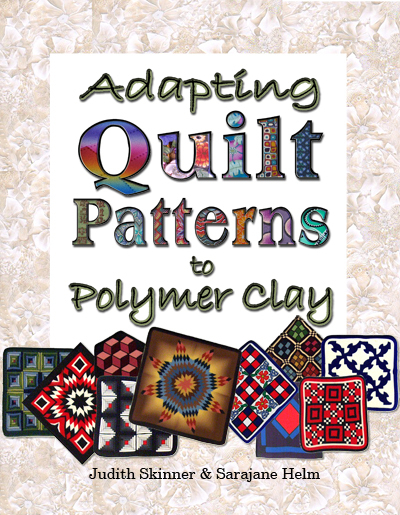 This book is a must-have for anyone interested in polymer clay quilting. Great job Judith and Sarajane! When I got your book in the mail, I sat right down and read every page from front to back page. It is terrific!!! It’s better than I had expected. I have already recommended it to quite a few people. I will be teaching a group of basket weavers the basics of polymer clay caning in February. I’m sure this book will inspire them. Specifically, the nine patch variation. I can’t wait to make a few example canes to show at my workshop. Thanks for doing this research and for your continual inspiration. I received my book…wow, you two did such a fantastic job. Had a few minutes to sit down and browse through it last night and I’m so impressed….the quality and clarity are _superb_. Congratulations!